I'm happy to say I survived the USA Criterium Pro Championships this past Thursday night. It wasn't easy placing 22nd and winning a $100 prime and I certainly can't say it was my most enjoyable experience. I crashed twice on the 1km, 5-turn, plus a round about course. As quoted on Cyclingnews.com, this was the wolds richest parking lot criterium. If you like seeing red bull chuggin', No-Doz poppin' crazy criterium racers duke it out under the lights this was the place to be. The large prize pursde meant guys were laying it all out on the line to dip into the cash pot up for grabs almost every lap. Hand fulls of money were up being thrown out including a $5,000 prime with two laps to go. My second crash was the one that almost ended my night in turn number number one. A guy two wheels ahead of me clipped his pedal and took down the guy just ahead of me. I ended up going straight over the first guy and landed on top of him, which definitely helped my fall. When I got up I had to untangle our bikes and get his handle bars out of my front wheel. I then rode the course backwards to the pits and realized my bars were pointed in the wrong direction. Luckily the guys in the Mavic pit took care of me and I got back in the race one lap later. Somehow after my last crash I still had the motivation to make something of the night and I kept making my way one by one to the front of the group. This was no easy task as you could only really pass guys within the last quarter of the course leading into the finish stretch. The instant I saw the front of the group, about lap 40 of 60, I took my chance and took off for a one-lap flyer. Luckily for me it was a prime lap, although it was the smallest prime of the day at $100. Oh well. Thankfully I don't do this for a living anymore. As we hit the last 10 laps I knew things would get absolutely death defying. I decided to sit in about 30th position knowing that the prize money went 30 deep. Not too many guys were going to pass me as it was single file and my nose was pretty much pinned to the front wheel hitting top speeds. I made my way through the carnage of the last laps which pulled me up to 22nd at the finish. 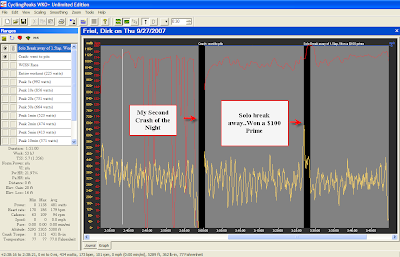 The power output for this event was not that high since it was such a technical course. I spend a lot of time coasting and in fact 12% of the race was spend not pedaling. Burning Up the Matches- There were 195 instances where I hit more than 480 watts for more than 4 seconds within the race. Compare that to only 2 instances where I was over 480 watts for more than 10 seconds. That was the last race of my 26th year of racing and a race like no other I've ever done. Vegas here we come! I'll be attending the Interbike show next week (the 26th-28th) along with my partners at Peaksware. It is always an exciting time to connect with the cycling industry and see all of the newest products. In addition to all of the usual booth browsing and "after hours" activities, this year's show has a few additional events including two high profile races. 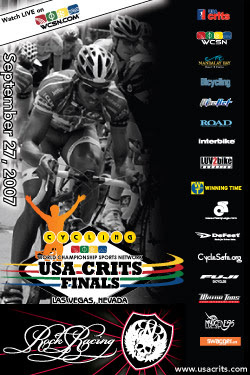 Wednesday night is the cyclo cross race Cross Vegas, and then the USA Criterium Series finale race is Thursday night at Mandalay Bay. I'm looking forward to actually being a competitor in the Crit Worlds next week. My season has gone incredibly well and I was able to squeeze out an invitation to the race. For anyone attending look for me in the orange and purple Vitamin Cottage team on a bright orange Eddy Merckx frame. If you are attending the show look for the Peaksware (TrainingPeaks/CyclingPeaks) guys to be roaming the show floor. Joe Friel will also be presenting within the Polar booth several times and Hunter Allen will have a big presents within the Lemond Fitness booth. Look for my Criterium race file to be posted here after the event. Live Video coverage of the USPRO Time Trial and Road Race Championships from Greenville, SC. How will Saul Raisin do? Where has Tyler Hamilton been and how will he do? Will Chris Baldwin come through and win nationals after crashing and getting second in 2006? This should be an exciting TT with a lot of stories to follow. Tune and check out the TT live today and be sure to watch the road race champ's tomorrow too.